Rick and Morty (2013) is a comedy cartoon, written by Dan Harmon & Justin Roiland that has as its central protagonists a Professor and an assistant that, at least in the pilot episode evokes and plays with the relationship of the characters “Doc Emmet Brown”, as played by Christopher Lloyd and "Marty McFly", as played by Michael J Fox, from the Back to the Future (1985 -onwards) series of movies and associated products. The "Doc Emmet Brown" type character is called Rick and the “Marty” type character is called Morty. The similarity of the Morty name to Marty is possibly intentional. Both characters can be argued to evoke variations of the relationship of Marty & Doc Emmet Brown from the “Back to the Future” series of movies, who are in turn contemporary (1985 -1990) reinterpretations of the classic silver screen Professor and assistant trope, examples of stories featuring this kind of relationship are Doctor Who, Sherlock Holmes and in the relationship of the characters of Walter White & Jessie Pinkman in Breaking Bad (2008), Dr Bunsen Honeydew & Beaker in the Muppets (1976 -1981) or even to the trope of the mad scientist established with C.A Rotwang in Metropolis (1927). 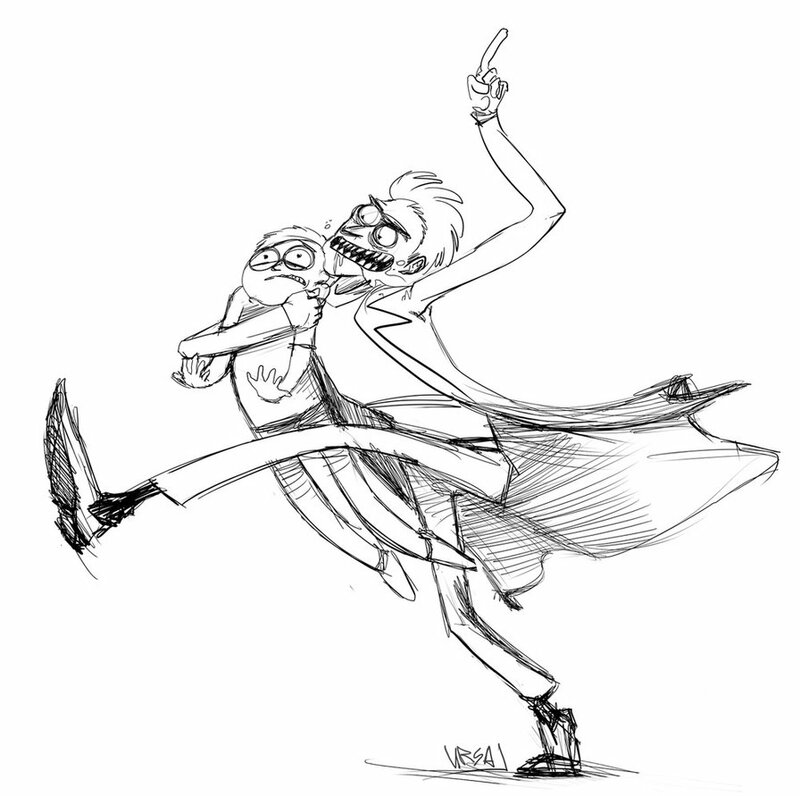 Some of the humour derives from the different characteristics of Rick and Morty to the established Professor and assistant trope. Rick, Morty’s grandfather, is a callous whisky drinking scientist while Morty is an adolescent high school student, ultimately they work as a synergised team, sometimes remarkably unsuccessfully (see episode 6, Rick Potion Number 9) . Rick is played differently from Doc Emmet Brown in a number of ways, the characters speech, despite being a grandfather, sounds like a young man, using contemporary slang, and in play with Doc Emmet Brown's catch phrase of "Great Scott! ", Rick consciously adopts a nonsense catch phrase "Wub a luba dub dub", that is never used in an appropriate context. Ricks motivation for having Morty as a side kick is kind of suspect, the pilot episode establishes that Rick may not be a good influence on Morty. As an interesting aside, I was looking through fan art of this show, to see if any had captured the spirit of the show in a summarizing fashion, found art by Obman-Veschestv that seemed to evoke the art style of Gerald Scarf or Ralph Steadman (political cartoonists). The malign aspects of their relationship is part of the humour and it is elaborately developed in episode 10, ” Close Rick-counters of the Rick Kind’, where it is established that Morty’s brain waves cancel out the “genius” brain waves of Rick, providing a kind of stealth shield, masking them both from detection. This is the kind of improvised seeming plot developments that compose the show, but they are sequentially consistent from episode to episode. As a note, it is unfair to use "fan art" to criticize a cartoon, the art of the cartoon is generally bright and colourful, but my intention is to convey a summary of the impressions Obmann-Veschesty decided to convey. Also, its the internet, go figure, caveat emptor. Rick and Morty's content appears to be aimed towards an intended audience of adolescents and young adults, regularly using the settings of Marty's High school and Marty's family home. The plot lines include situations that feature the concepts of jealousy, mediocre patterns of faithfulness, psychological trauma, different forms of love, sexual molestation, gender issues, and also gender issues, political expediency, the absolute destruction of the world through the plot device of a love potion, inter-dimensional universe jumping that leads to increasingly bizarre situations and regular Inception like convoluted plot lines, that can become nonsensical if you're not paying attention. A recurring plot line involves traveling between universes, which function to "raise the stakes" (Grayson 99 : 2013) in the story and create remarkably absurd situations that push the boundaries of comprehension in the short time span of each changing scene (Grayson 99 : 2013). An example of this is in episode 10, ” Close Rick-counters of the Rick Kind’ where the protagonists rapidly jump to a universe where people are sitting on chairs using the telephone to order pizza to another universe where pizzas are using telephones to order people and then rapidly to a universe where chairs are sitting on people eating telephones, yet the protagonists are still functioning within each of the new universes. (As an aside the last episode of Phineas & Ferb, season 4 episode 48 (12th June 2015), The Last Day of Summer used a similar universe time traveling plot line to symbolize the recurring plot structure of the series and examine the influences of the characters lives on each other, it was about providing closure to its audience). The humour of the series tends to be cynical of tradition and the accepted discourse that functions as the basis for relationships within the idealized Western nuclear family, but then despite their differences the cartoon's family does tend to show cohesion, thus one could argue that it examines the basis for such relationships outside the traditional discourse. Dan Harmon, in an interview with Adweek (Grayson 59 : 2013) describes the underlying situation of the show is where "Science rules supreme, marriages are on the rocks, and things get so chaotic that it does boil down to the petty emotional issues of humanity. And the moral is that we're all pretty insignificant" (Grayson 59 : 2013). Science in the series is a source of hope and adventure, the same aesthetic evoked by the "Doc Emmet Brown" character in the Back to the Future series of movies (1985-onwards), but it is countered by the burden of knowledge, quite often the cartoon uses the character of Morty to demonstrate the concept of trauma and pessimism. The hilariously bleak repercussions for Morty, of Ricks failed love potion in episode 6, Rick Potion Number 9, were conveyed by the absence of sound, to convey the psychological trauma and later episodes reference this. To conclude, and this is less than a summary and more an example of the logic of the cartoon, because I am in the end a fan boy, I would like to provide a representative example of its content that does not feature traveling, set in the family home, from episode 2, “LawnMower Dog” where the family dog becomes sentient. The dogs sentience is considered cute at first but backfires when it sees how humans treat dogs and have bred them into stubby legged toys (ie the concept of the toy dog). The cute fluffy white family dog over a series of scenes builds a speech synthesizer and an exoskeleton so it can interact and communicate with the family. This eventually leads to a scene where the dog wakes the family’s daughter, Summer, in the middle of the night and asks ominously, in an calm computerized voice, that evokes HAL from 2001 Space Odyssey (1968), “Where are my testicles Summer? What happened to my testicles?”. It gets even more complex from then on. Season one is at http://www.adultswim.com/videos/rick-and-morty and Season two starts soon. Obman-Veschestv link to see artwork. Grayson, Nowark. (2013). Absurd Parody for Night Owls : Understanding Adult Swim's Offensive Content. Thesis at Emory University. Page 59, 60 & 99.